When looking for the best in quality and value in food storage The ARK 390 by Chef’s Banquet fits the bill. This incredible food kit has nearly 33 pounds of compact just-add-water meals. That’s a lot of food! Truly a flagship of the preparedness food industry, the ARK 390 has enough food to supply one person with 2,000 calories a day for 30 days. From a large variety of great tasting recipes to top-of-the-line packaging, including the patented Gamma Seal lid, this food kit has it all. Each of the recipes has been selected for versatility when cooking. Add Chef’s Banquet freeze-dried fruits or vegetables to mix things up. Whether you are just getting started with a preparedness plan or you are adding variety to what you already have the ARK 390 is ideal for any self-reliant minded person. To really pack in the value all meals are individually packaged in large re-sealable metalize pouches. Then the bulk pouches are packaged in a heavy-duty 7-gallon plastic container and then sealed with The Gamma Seal lid. 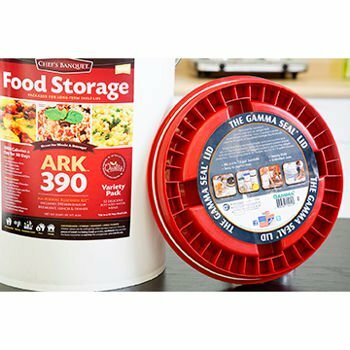 Get Security and Peace of Mind with the ARK 30 day emergency food kit. If you are unsatisfied with your purchase we promise to work with you to make it right.